The main objective of this post is to help you to get all the details of the Battery in Android. First we need Intent Filter. Which response with Battery status change. Create New Method named registerBatteryLevelReceiver() into MainActivity class and call this method into onCreate(). 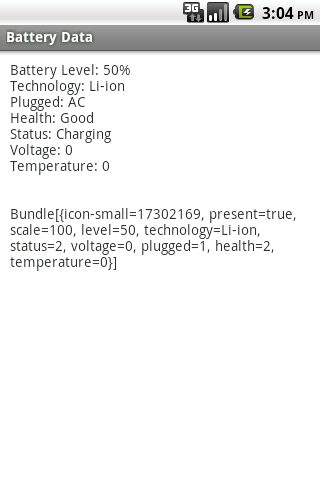 And also add textview into Layout File for display the Battery data. Then we need Broadcast Receiver for receiving data with Battery Status change. Past Following code outside the onCreate() Method. getPlugTypeString() Used for Charging Type. getHealthString() Used for Health Type. getStatusString() Used for Battery Status. Finally we need to set Battery data in textview. I hope you enjoy this tutorial and it would be helpful to you.